High-gloss, citrus-based foul-release polish for everything below the waterline. 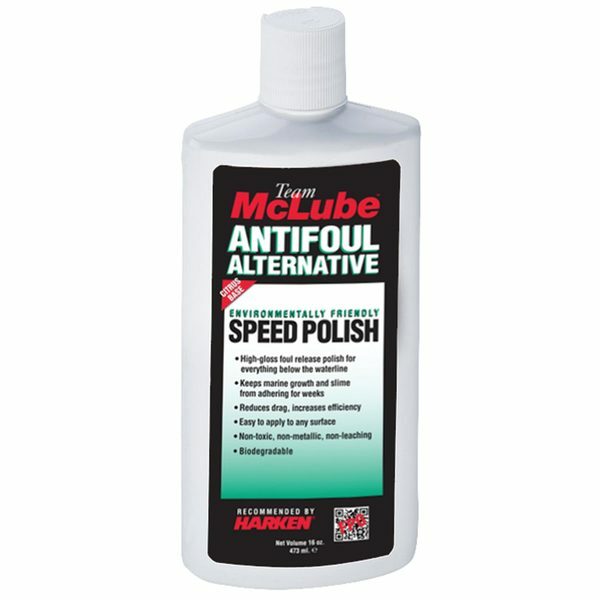 McLube’s Antifoul Alternative is a high-gloss polish that inhibits marine growth below the waterline and keeps your hull fast and clean for weeks at a time. Citrus based and fully biodegradable, this breakthrough product is quick and easy to apply. It has been aggressively field tested on boats racing in the Volvo Ocean Race, one-design keelboats, RIBS and powerboats worldwide. For boats that are sailed for longer periods of time or moored in the water, McLube introduced Antifoul Alternative—a speed polish with all the same benefits as HullKote, plus foul-release properties to prevent marine growth and slime from adhering for weeks.